I have a size 8 foot which is rather wide. I usually CO around 72 stitches using sock yarn and size 0s, but next time I use Opal yarn, I'll probably cast on 80 stitches because my mom's socks seem a little tighter than the socks I've made with Austermann or Trekking. Divide evenly onto 4DPNs, join, and use the 5th needle to work. K2, P2 for about 18 rounds. Then, knit to desired leg length. For me, the magic number seems to be around 72 rounds. Just seems the perfect length for me, but this length is purely a preference thing in my opinion. If you plan to make your heels and toes a different color like this one, you'll be joining your heel color when you start the purl row on the heel directions. The advantage of having a different heel color is that you won't have to find the pattern again after making the heel and it looks pretty cool, but you can continue with the self-striping on the heel like these. Heel: After finishing the last leg round, turn your work and for Row 1, slip the first stitch purlwise, then purl across for 35 stitches (including the slipped stitch, it will be half your total stitches). (Instead of turning your work and purling, you can learn to "knit backwards"; it works well for a few stitches so you don't have to keep turning your work. You can see my tutorial with pictures here on knitting backwards.) Row 2: *Slip 1 purlwise, K1; repeat from * across. Repeat the two rows for desired length, usually around 40 rows. Heel turn: Row 1: slip 1, purl 18 across (If you use a different number of stitches than I did, this number will equal half of your total heel stitches. So I had 36 heel stitches, half of that is 18. If you have 40 heel stitches, you would purl 20 across), purl 2 together, purl one. Repeat rows 3 and 4 until all stitches have been worked. If you were using a different heel color, after finishing the heel, you'll cut the heel color and pick the original pattern color back up so you'll be knitting across the instep (the top of the foot). If you were using the original self-striping, then you'll cut the yarn after the heel and wind off enough to match up the stripes pattern on the instep. 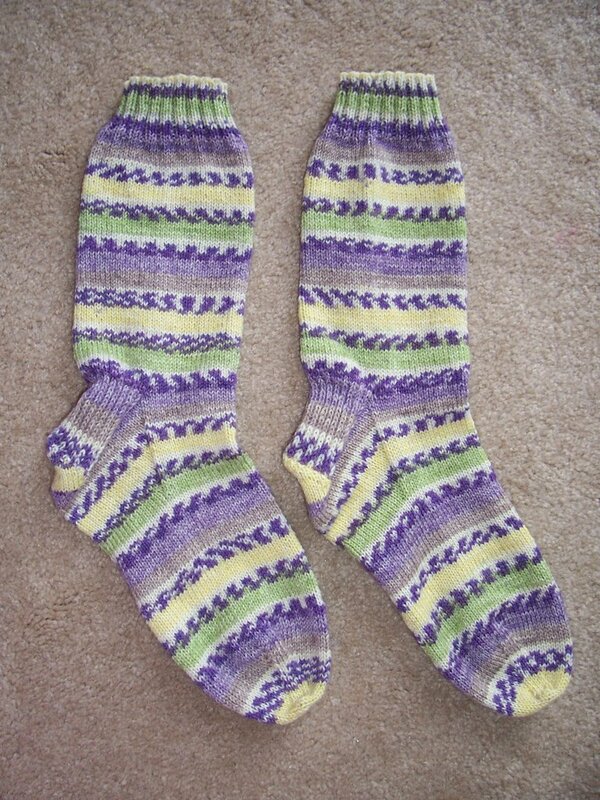 Join and knit across the instep (the instep should be on two needles, equally divided). On an empty needle, pick up 21 stitches along the gusset (or one more than the number of rows you did for the heel), knit half of the heel stitches. On another needle, knit the other half of the heel stitches and pick up 21 stitches. Your round will now start on the instep. Repeat these two rounds until you have the original number of CO stitches. Knit rounds until desired length – for me, that's about 50 rounds. Toe: Remember your round begins on the instep. If you want your toe a different color, do one plain old knit round of the new color before beginning the toe rounds. Repeat until you have half the original number of stitches. For me, that's 36 stitches. Then repeat Round 1 until 20 stitches remain. Graft or kitchener the stitches. (Just google kitchener stitch and you'll find plenty of help there. I always have to look it up.) Weave in the loose heel ends and any other loose ends. Again let me know if there's anything I should fix in the pattern. The only other thing I can think of is that I've always had plenty of yarn left over when using Trekking which has around 450 yards. So if you use a comparable yarn, you shouldn't have to worry about running out. 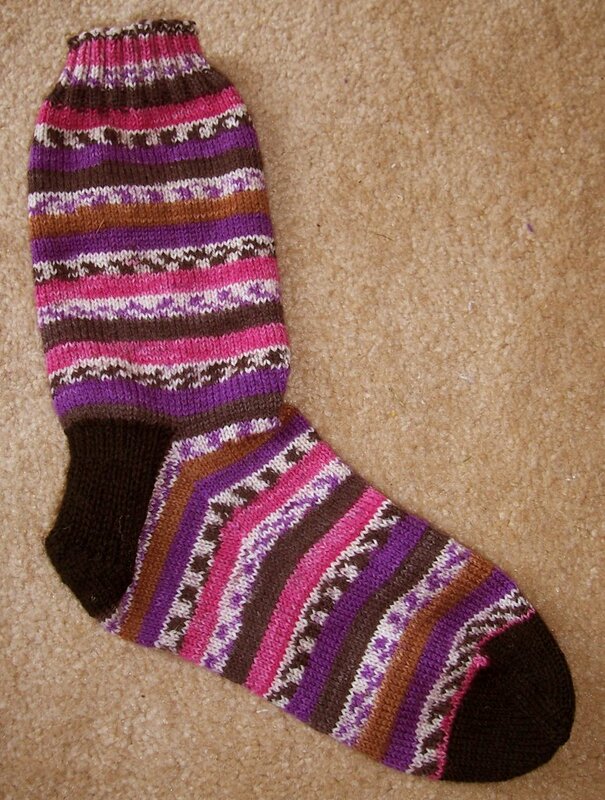 thanks for the pattern...my opal tiger sock is 75% done and looking great....the best heel i have ever done! Thank you! Thank you for putting into words and numbers what's been rattling around my brain. I can make any sock now I know that the heel flap is half of the stitches and the gussets are one more than the # of rows of the heel flap! Magic!